See Gladiolus carneus Delaroche for a description of the species. 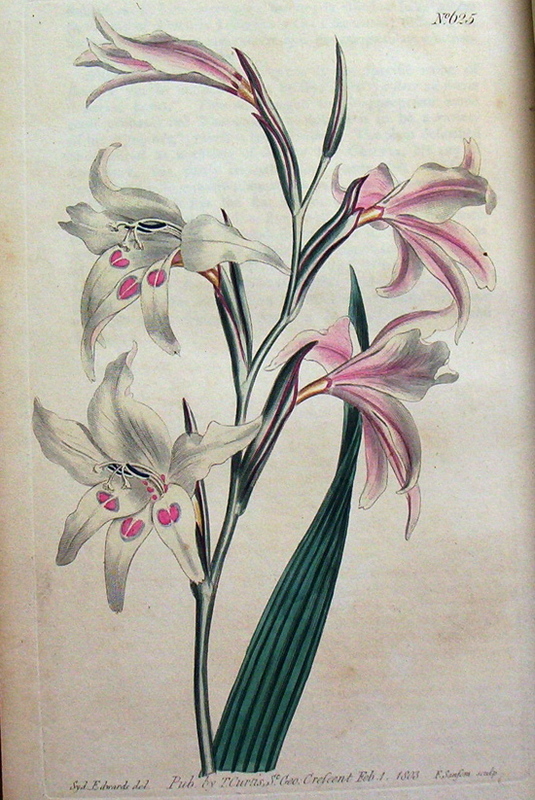 Although Gladiolus carneus and G. blandus are the same species, the separate catalogue entries suggests that they were quite different in appearance and they were acepted as separate species by many botanists at the time. Gladiolus blandus is generally described as having white flowers with carmine markings and the name indicates a pale flower. Gladiolus carneus is a very variable plant, from white to salmon in colour, open or quite narrow in form and marked more or less on the bottom petals. There are also significant differences in habit, some varieties being much taller than others. Gladiolus blandus was first figured in Andrews' Botanical Repository, the ‘large white-flowered gladiolus’ having been introduced to Kew Gardens by Masson in 1774. [ABR pl.99/1800]. Curtis’s Botanical Magazine figures a number of varieties. ‘All the varieties are very ornamental, blow freely, and propagate plentifully both by seed and offsets.’ [BM t.625/1803]. ‘This is the strongest and largest variety of the three, and the segments somewhat shorter and arranged in a wider or broader campanulate form than in the others.’ [BM t.645/1803. This is the plant figured here]. ‘[Gladiolus blandus var. b ‘Snow-white Corn-flag’ is] a mere variety of the species above referred to. Generally a lower plant than the other two.’ [BM t.648/1803]. ‘[Gladiolus blandus var. d ‘Painted Corn-flag’]. The tallest of all the varieties of this fine species, being sometimes more than three feet high.’ [BM t.1665/1814]. Listed in all published catalogues [B.125/1843]. Received per ‘Sovereign’ in 1831 [MP A2948-2].